Check out our sweet pototo that we have been growing. He started budding in our pantry in early June and we popped hime into this cool little thrifted vase and he just took off. We have never been successful at growing a potato. S0 we are delighted that this one thrived. He was quite thirsty too. Needed water almost daily–maybe because of our warm climate. We waited a little too long to get him in a pot. The roots are crazy thick, started taking the shape of the vase. While we were potting Mr Potato Plant, I decide to get some of my other new plants in pots as well. A few of them are in biodegradable bamboo pots. Kind of anxious/excited to see how those work out for us. Now, does anyone know what will happen next. Will my potato plant give me a new potato? 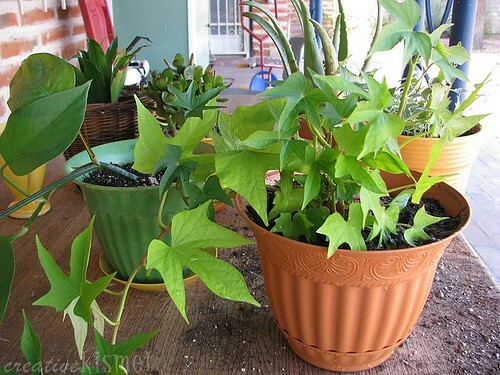 This entry was posted in Fun kid stuff, Grow and tagged planting, plants. 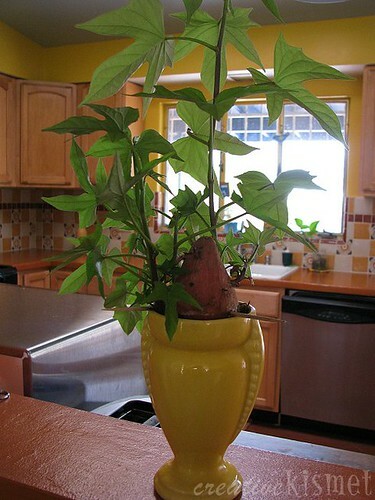 sweet potato plant, sweet potato. Bookmark the permalink. Looks lovely. You can eat sweet potato leaves, one of my favorite green veggies. Wow! What a neat project! 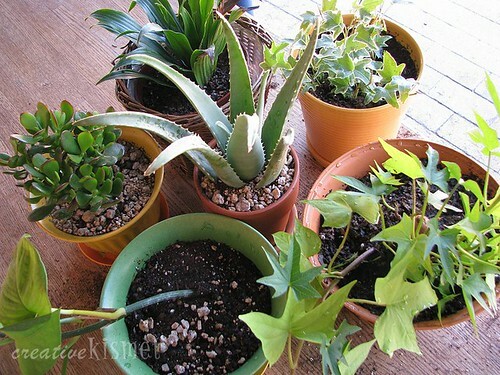 You know how much I love gardening and there’s always more to learn about container gardening. Now I want to go grab a sweet potato and throw it in our dark pantry so Annabelle and I can do yet another experiment, lol. Btw, the pots are gorgeous and it makes for a wonderful looking collection too. Probably not enought room for anymore potatoes to grow. Since it’s a vine it will grow on and on forever. Cool! I want to grow sweet potatoes too! Great project. Last week, I threw away two budding sweet potatoes. I wish I had seen this first! 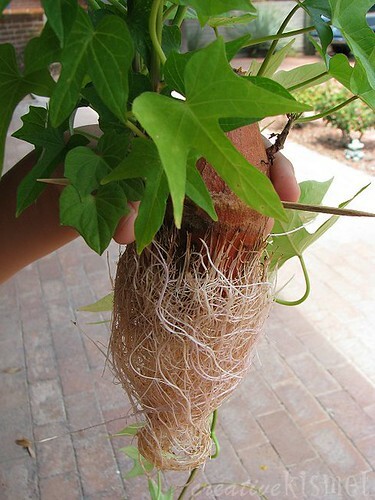 Wow, that’s one crazy sweet potato plant. That is soooo cool, I love how the roots took the shape of the vase!